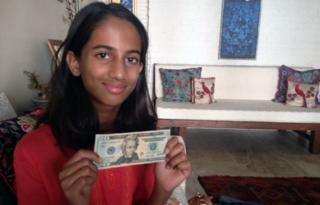 Last September, when the Indian government was struggling to control the rupee's massive slide against the dollar, a worried 10-year-old schoolgirl sent a $20 (£12) bill to the governor of the country's central bank offering to help the economy. Raghuram Rajan took over as the governor of the Reserve Bank of India (RBI) on 4 September 2013 - the following day Laila Indira Alva sent him a letter. "I have heard about the crisis our economy is facing on the news. I have also heard about the fall of the rupee with respect to the dollar," she wrote. Laila, who lives in Gurgaon, an affluent Delhi suburb, is not someone who usually spends time worrying about the economy - like most 10-year-olds, she likes playing with friends and other activities such as reading, singing, playing the guitar, swimming and athletics. But last summer, bad news about the economy made the headlines every day - the manufacturing sector had slowed down, the rupee was continuously sliding against the dollar and India's current account deficit was growing wider by the day. As her parents take several daily newspapers, Laila saw all these stories of impending doom and grew alarmed. "I knew the economy was weak because of inflation and corruption. I read about it in the newspapers and I heard my parents talk about it at dinner and I heard about it on the news. That's the only thing everyone was talking about." Laila was worried that "people won't have enough money to make a living and everyone will suffer and everyone will become poor," she says. Her mother Pria Somaiah Alva says she and her husband often talk to Laila and her 13-year-old brother about what's in the news. I want people to come to India and not to think that it's corrupt and a dump! "Last September, we were sitting around the table, my husband and I were discussing the dollar rate. And Mr Rajan was in the news, he was going to take over as the bank's governor so somewhere how the bank controls the economy came up," she says. The next day, after returning from school, Laila asked her mother if she could write a letter to the RBI governor because "maybe he can help the economy". "I said 'go ahead, you're a kid, you can do what you want'," Pria says. "Dr Raghuram Rajan, please bring in some new ideas that will improve our economy. I want people to come to India and not to think that it's corrupt and a dump!" Laila wrote in the letter which has recently been published in her school magazine. She also decided to include a $20 bill her parents had given her during a family holiday in Israel a year ago because she thought "the country needs it more than I do". "Many people say it starts with little and then it becomes big, so I thought that my $20 would be a little. But I thought if people had the right thought in their minds, then they could make it big. I thought that everyone will contribute a little bit to help our economy and India will progress," says Laila. About 10 days later, an official looking envelope arrived, addressed to Laila. She was shocked to discover that it was from the bank governor himself. "I am deeply touched by your kind gesture," he wrote. "I am aware this is a challenging time for the country and I have no doubt the economy will emerge stronger." The envelope also carried the $20 bill she had sent. "I am returning the $20 note you had sent with the assurance that we have adequate foreign exchange reserves in RBI to manage the situation," Rajan wrote and invited her to visit him next time she was in Mumbai. Laila says she was "really surprised" by the response. "I thought it was common to write a letter to the RBI governor, I thought he won't really read it and he'll just ask someone else to write back." Laila was not happy to get her money back though and thought that "it was mean of him not to take it," she says. But her parents explained that "there are different ways in which one can help one's country". In November, when Laila's father went to Mumbai on business, she went along with him to meet Rajan. "She was very happy, very impressed with the RBI building. She visited the coin museum and returned laden with comics which simplify money, even for adults. But her first reaction was - Mama, he's very tall," says Pria. "He is very tall," insists Laila. "There's a picture of both of us and he's extremely tall, he's like a giant." At her meeting with Rajan, she asked him questions like "why can't the RBI print more money for everyone so that people aren't poor? He told me that it will lead to inflation and then he explained the whole concept". On the wall behind his desk, there were pictures of past RBI governors, but "there was no lady governor so I was shocked and I asked him why? He said maybe you can become one some day". So is that what she wants to do when she grows up? "Maybe, but I want to be a photographer first and then an author and then a singer, maybe someday work to become the governor of the RBI," she says. At present she is not too concerned about the economy. "Last year it was 70 rupees to $1, but now Mr Rajan has brought it down to 60." And about the $20 bill, Laila admits that at one point she thought about changing it into rupees and spending it, but now she has changed her mind. "I think I'll frame it with the letter," she says.